Remove or minimize the sources of a fire – We all know the three sources of a fire are fuel, oxygen, and heat. Keeping these separate then is the key to fire prevention. If you have a designated smoking area at your workplace, make sure it is away from the building and flammable objects. Cigarette butts should be properly disposed of, and certainly not in the mulch! Keep combustible materials such as liquids and vapors away from heating sources. Clean your work space – Dust, trash, and other waste can accumulate at your workplace. Maintaining a clean environment will help ensure there isn’t fuel to add to a fire, or to start one if it’s in the vicinity of a heating source. If the trash is full or there are other accumulations of waste at your worksite, clean it up and properly discard them outside or off-site. Keep an eye on your electrical equipment and power sockets – Electrical hazards are one of the primary sources of fires. Ensure your equipment is properly maintained, and anything that is past its prime is replaced. Don’t keep those damaged cords or plugs around! Overloaded power sockets are a no-no as well. 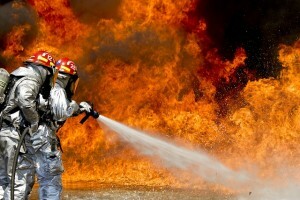 Minimize the chance for human error or negligence – Educate your employees on fire safety. Employees play a key role in making sure the first three steps are being followed. They can provide an extra pair of eyes to help you minimize your fire risk. Keep your fire protection equipment in good, working condition – The building owner or facilities manager will be able to tell you if your fire equipment is in proper working order. If a fire does start, you want your sprinkler system to actually work and put out the fire. Run weekly tests on your fire pump and keep results in a written log (more details in our fire pump testing blog). Keep other equipment like fire extinguishers in good, working condition as well, and put them in easily accessible areas that the staff is aware of. Following these five simple steps will help ensure that your business doesn’t become one of the 70,000 to 80,000 serious workplace fires we see each year. We’re here to help if you need to update your fire pump equipment, need jockey pump service, or have questions on fire controllers, drivers, tanks, or accessories like flow meters, pressure switches, or valves. Simply use our service or info request page.